There are 6 posts tagged Business (this is page 1 of 1). 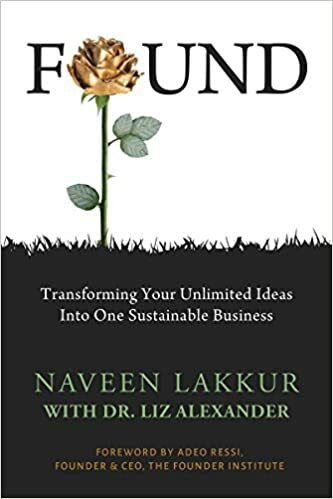 Dr. Liz Alexander (who I interviewed in 2013 on the topic of thought leadership) and Naveen Lakkur (Director, Founder Institute, India) wrote a new book titled “FOUND – Transforming Your Unlimited Ideas Into One Sustainable Business”. The book is short but powerful enough to help entrepreneurs and ideators in bringing their ideas to life by following a proven five part framework. I loved the simplicity of the framework and real-life case studies which complement the insights. I interviewed Dr. Liz and Naveen Lakkur to learn more about the book and how it can help ideators and entrepreneurs. [Tanmay Vora] Thank you Liz and Naveen, for sharing your insights here. I read your new book “FOUND – Transforming Your Unlimited Ideas Into One Sustainable Business” with great interest. I was curious to know what prompted you to write this book? Thank you, Tanmay, for your interest in FOUND, which was a labor of love for us both. We always intended that this contribution be a catalyst that increases the success rate of entrepreneurship, not just remain a book. Especially since there seemed to be such a waste of time, energy and financial resources by many entrepreneurs in pursuing ideas that could not support sustainable businesses. You may have seen the statistic quoted by Adeo Ressi, the CEO and founder of Founder Institute in the Foreword to our book, that only about four in every 1,000 startups founded each year create a global impact. That equates to a 0.4% success rate, which I think you will agree is shockingly low. We sincerely hope that by following the proven, five-part process outlined in our book, we will see a considerable improvement in this figure in the months and years to come. [Tanmay Vora] What is the number one thing according to you that keeps people from acting on their ideas? It’s a great feeling, isn’t it, when you have what you believe to be a winning idea? You imagine that executing on it will be fun, easy, and rewarding. It’s only when you have to take action that you are thrust back into the world of reality. So we would say “fear of failure” is the top thing that stops people from moving forward with their ideas. Because then they have to face up to the fact that their desired outcomes may or may not come about. You have to have a strong heart and a huge amount of commitment to succeed as an entrepreneur—in fact, any kind of ideator. Which is why, for many people, it’s more comfortable for them to say, “I could have gone ahead with this idea, but….” and find excuses for not taking action. Despite the fact that there is always a huge amount of learning and benefit that comes out of seeing whether that idea could have become a viable business or a new product or service within an organisation. “fear of failure” is the top thing that stops people from moving forward with their ideas. [Tanmay Vora] Ideas are cheap, they say, execution is everything. But executing on an idea that is not viable is even worse. Is there an approach to guide us when assessing the business viability of our ideas? You’ve hit the nail on the head of what the FOUND process is all about, Tanmay. The five-part framework we make available to readers reduces the time, money, and effort they may have otherwise expended on an idea that couldn’t become a business. Let us offer a story from the book to illustrate what we mean. One of mentees that worked with Naveen through the Founder Institute, Bangalore had a background in Human Resources. He had a concept he called “Experience Zones” that he believed would boost employee engagement in large organizations. This, as we know, is a major issue to be solved. So you would expect that there would be no end of companies all vying to back this HR executive’s idea, right? Sadly, that wasn’t the case. When he had visited 25 different companies to ask them what they thought of his idea, everyone said it was great and he should move ahead with it. But the “N” within the acronym FOUND stands for Negotiation. By that we mean getting more than tacit agreement. This ideator’s assignment was to get at least three letters from companies prepared to financially back his idea. But none of the 25 people who had been so enthusiastic about the overall idea were willing to put money into it. That’s just one of the five parts of the FOUND process and all of them are essential as a discipline to follow if an entrepreneur (or intrapreneur) wants to confirm they have a market that will pay for their solution. [Tanmay Vora] What are the top three things that an entrepreneur should do before they start acting on their idea? What entrepreneurs should always look for is to offer a solution that fills a current or potential market need, rather than create a solution that’s looking for a problem to solve. 1. Co-founders who can bring different skills and experience to the business, perhaps through a background in marketing or sales or different technical competencies. 2. Customers who, early on in the development of the business, are willing to pay for the solution and prove there is a ready market for it. 3. Catalysts, such as ideation specialists and intellectual property lawyers whose expertise can help guide the start up through some of the stormy waters that lie ahead. By engaging with all three of these groups, the business can truly accelerate. What entrepreneurs should always look for is to offer a solution that fills a current or potential market need, rather than create a solution that’s looking for a problem to solve. [Tanmay Vora] My last question stems from Naveen’s introduction in the book which says “Converting Creative Concepts into Commerce with Compassion”. People believe that in most cases, commerce and compassion don’t go well together in a world of cut-throat competition. What does compassionate commerce really mean? Thanks for this question, Tanmay. I (Naveen) has always believed that these two concepts can co-exist. If you take the definition of compassion it means having a deep awareness and sensitivity for others, especially when it comes to their misfortune. In the Free-Flow chapter of our book we point to how so many successful ventures have been the result of different emotions experienced by the founders. Take redBus in India, for example. The whole idea came from the fact that one of the co-founders, Phanindra Sama, wasn’t able to buy a ticket to travel back to his home town during a major festival. It wasn’t just his disappointment that caused him to take action and create redBus but his recognition of how much distress this kind of lack of organization causes others. In fact, we quote his co-founder, Charan Padmaraju in the same chapter who said, “It was all about building something that would be useful to someone.” It is that compassion in understanding that there are major pain points that you can solve for others that makes for the most successful commercial enterprises, in my view. My specialization is to play the role of a catalyst to help these creative concepts become commercial realities, with compassion built in. Otherwise all we have is cutthroat competition. [Tanmay Vora] Thank you so much for sharing your views here, Naveen and Dr. Liz. I am sure readers of this blog will find these ideas and your book, useful in bringing their creative concepts to life. Thank you for the opportunity to share our perspectives on the ideation process, Tanmay. We’d like to close by pointing out that by following a similarly disciplined process to the one outlined in our book, the Founder Institute has achieved a 91% success rate in terms of ideas that survive, a 70% success rate of entrepreneurs that execute on their plans, and close to 45% success rate of ventures that have attracted external funding. By any measure, all of those statistics are considerable improvements on the 0.4% figure we mentioned in our first response. Too Much Celebration Around Failure? Failure is glorified. In a number of start up events that I have attended, people eloquently talk about how many times they failed before their venture took off. Successful entrepreneurs and role models tell us that failure is good. I also think not all failure is good. What’s important is being able to tell the difference between the productive failures, where you were a bit overly ambitious but learned important lessons, and wasteful failures, where you’re just throwing out ideas without thinking them through beforehand. We learn how to walk only after we stumble a few times. We learn by doing, failing, adapting, learning and then applying that learning all over again. But in my view, too much celebration of failure sets us up for more failure and breeds complacence. We may be setting a wrong precedence for aspiring entrepreneurs and leaders. If we fail, we should certainly learn our lessons and there is no stigma attached to it – but only after we have done everything we could have to avoid failure. I also believe that we should not let our failures stop us from attempting again. Remaining optimistic and hopeful in the face of failure is a critical life skill. People seem to forget that start-up founders can endure years of psychological trauma for naught, employees can lose their jobs and investors can lose significant money. Rather than being a springboard to greatness, failure can simply be devastating. “Every time a company fails it is not a beautiful working out of the Darwinian free market and it is not a fantastic educational experience for all involved. Every death is a tragedy and that is even true of deaths of companies. Not all failures are worth celebrating, especially when stakes are high. And just because failure is marketed well does not mean we should buy it as easily. You can measure almost anything in your business, but if those metrics don’t serve a real business objectives, they are just numbers with no real meaning. Measurement is a means to an end, not an end in itself. I have seen extreme cases where organizations either measure so much or they don’t measure anything at all. Both extremes are dangerous, because it de-focuses people from doing the right things. Know your goals: Identify what are your strategic, tactical and operational goals. Understanding your business challenges and goals is the first most important step. If you don’t know why you are measuring something, you will get numbers and you won’t know what to do with them. It won’t help. Identify metrics: What metrics can effectively help you meet your goals? For example, if you reduce your defect rates, you can keep your customers happy. Reducing overrun on your project can have direct impact on your bottom lines. You get the point. Identify impact: Some metrics directly impact the goal, while others may have an indirect impact. Identify whether identified measurement has direct or indirect impact. A great way to do this is to draw a two dimensional table with business objectives horizontally and measurements vertically. Map the impact and you will have a great view of your business goals and impact of those metrics. Establish operational procedures: You can now establish processes and methods to collect the data, frequency and consolidation mechanism. This is also a great way to ensure that all your operational processes are aligned to perform in a way that it satisfies at least one or more business objectives. Don’t forget the “invisibles”: My earlier post “The Invisibles in Business Performance” touched upon one of Deming’s seven deadly diseases – “Running a company on visible figures alone” and listed out some areas of your business that cannot be measured, but can have direct impact on your business. Striking balance between managing these invisible aspects, managing by visible numbers and focusing on people seems to be the optimal route to manage the business. Bonus: Read my post (How to) Have a Great Monday! – and have a wonderful start into the week! When you deal with customers in your organization, you can either comply to contractual terms and deliver what is expected. Or you can go a step forward to assess opportunities to add differentiated value (Remember 102%?). When I refer to customer here, it could be an external customer or an internal one (people within your organization to whom you provide your service). Don’t just understand customer’s needs, understand their business: Do you know why a customer wants us to build this software/product/service? How does it fit into the larger picture of customer’s business? How does it generate money for customer? These are important questions for understanding the context. When you serve your customer, you are helping them address at least one of their business objectives. Understanding what works for the customer helps you align your actions to the business objectives. That is a sure way to add value, because customer no longer looks at you as a ‘vendor’ but as a ‘partner’. Most folks in technical areas need to understand this critically. Communicating one-on-one, frequently: Great relationships are built one conversation at a time. Open and transparent conversations are opportunities – to understand and to convey. Iterations of understanding and conveying the right things results in a credible relationship. In an outsourced world, I cannot emphasize more on value of ‘face-time’ with customers. Most customers will not open up when they talk over Skype or a phone. Frequently visiting your customer and understanding changes in their business helps. Emails, newsletters, sharing updates, blog are great tools to ensure continuous communication. Ship Results: All said and done, it all boils down to results. Great results delivered consistently over a period of time is the best strategy to build a strong relationship. Results build long lasting credibility. When you have deeper understanding of client’s ‘business’ and when you have ‘communicated’ frequently to manage expectations, you are in a much better position to deliver meaningful results that delights the customer. Key is to manage expectations, give realistic promises and delivering on them. You cannot undermine the importance of relationship with your customers and how it directly impacts the quality of overall experience. Especially for folks in sales, if they focus first on being valued by the customer and build a relationship, sales happens as a by-product. The foundation for good engagement is built by bricks of value and cement of trust. Power question: What are you doing today to develop great relationships with your customers?